George McNeil (1908-1995) was an influential artist who rose to prominence during the Post-World War II era of American art. As a student in the late 1920s and early 1930s, McNeil attended the Pratt Institute in Brooklyn and The Art Students’ League in New York. From 1932 to 1936, McNeil was a student and class monitor for Hans Hofmann both at the Art Students’ League and The Hans Hofmann School of Fine Arts. McNeil emerged as one of the First Generation Abstract Expressionist and New York School painters during the late thirties. He was shown in the New York Worlds Fair in 1939, and in 1935 he was a member of the W.P.A. and served on the Federal Art project with artists such as Willem de Kooning and James Brooks. McNeil painted a mural intended for the Williamsburg Housing Project, which was supervised by the artist Burgoyne Diller. McNeil’s mural was never used and unfortunately disappeared during World War II. During the 1950s McNeil had a great amount of gallery and critical representation. 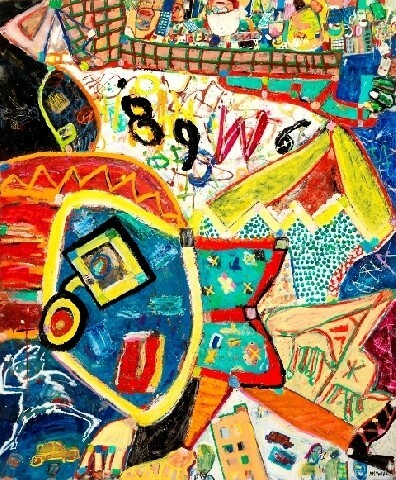 His work was exhibited regularly in one-man shows, first in 1950 at the Charles Egan Gallery, in New York. The Charles Egan Gallery also exhibited New York School artists such as Willem de Kooning, Philip Guston, Franz Kline and Robert de Niro Sr. After showing at the Egan Gallery until 1954, McNeil had exhibitions at HCE Gallery in Provincetown, Massachusetts, where he spent summers at the art colony from 1948-62; and the Poindexter Gallery, in New York through 1959. His work was regularly reviewed by such publications as Time Magazine, the New York Times, and ARTnews, and by influential art writers such as Thomas Hess, Barbara Rose, Clement Greenberg, William Seitz, and Irving Sandler. In 1958 McNeil joined a life-drawing group with Mercedes Matter, Charles Cajori, Sidney Geist and others, which began the genesis of the New York Studio School. The works of McNeil, his contemporaries, and their students was the subject of a recent exhibition at Steven Kasher Gallery in New York called "12 Painters: The Studio School, 1974/2014." McNeil also exhibited in group exhibitions at the Art Institute of Chicago (1947), Museum of Modern Art (1951, 1959, 1969, 1985), the Whitney Museum of American Art (1957, 1961, 1965, 1988) Solomon R. Guggenheim Museum (1961), and the Pennsylvania Academy of Fine Arts (1962, 1966). McNeil was showing consistently and frequently over the course of six decades. 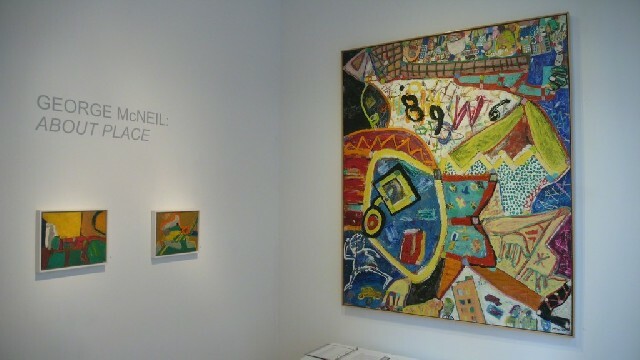 In addition to being a seminal Abstract Expressionist painter, McNeil became a seminal artist of the Figurative Expressionist mode, which was prevalent in both Provincetown and New York during the late 1950s and early 1960s (as well as concurrent movements in Chicago and the San Francisco Bay Area). 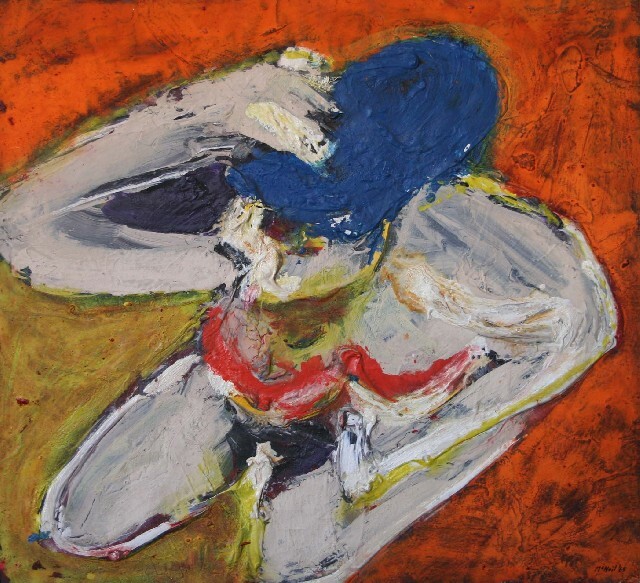 While McNeil’s work from the 1940s and early 1950s are eminent works of gestural abstraction, he had been interested with the rendering of the figure since his student days and his brief time studying with Andre Lhote in France. His output since the 1970s had been full on Figurative Expressionism, an obvious pre-cursor to the Neo-Expressionist movement in the 1980s. 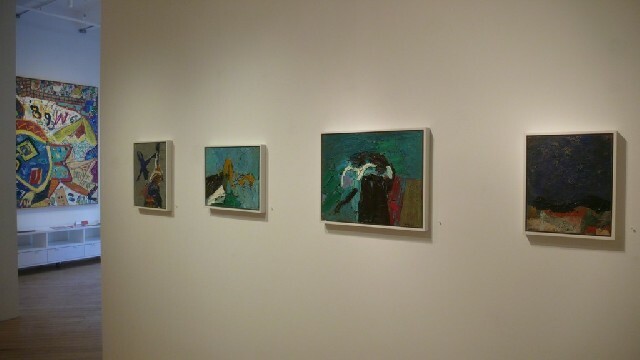 There is clearly a fusion of figural and abstract imagery in paintings leading up to that era such as Clandestine (1965) and Rhoda (1966), which I included in my exhibition “Pioneers from Provincetown: The Roots of Figurative Expressionism” at the Provincetown Art Association and Museum in 2013. This transition between abstraction and figuration is a focal point in the current exhibition George McNeil: About Place at ACME Fine Art in Boston. 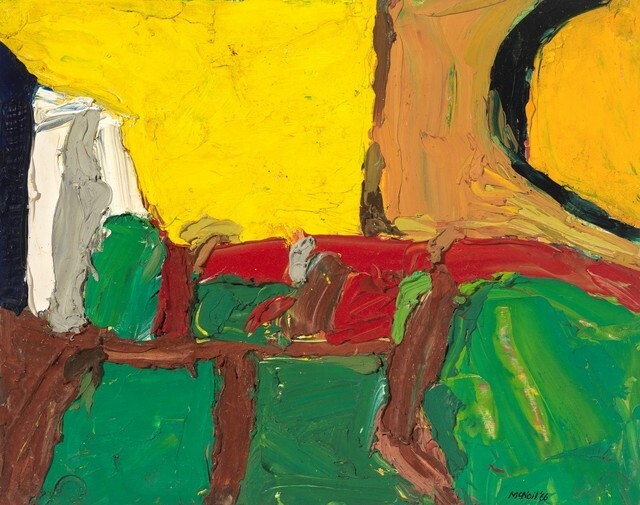 The exhibition focuses on the theme of the landscape exemplified by McNeil’s smaller heavy impasto figurative/abstract panels painted en-plein-air, and mural size Figurative Expressionist landscapes. 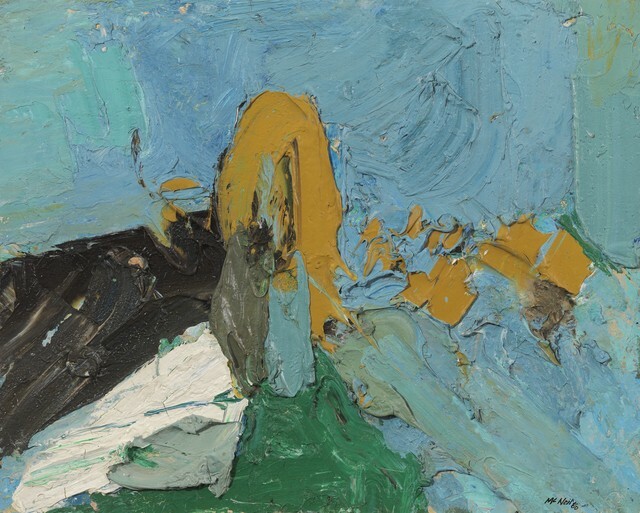 Landscape was a major source of inspiration for McNeil and the titles of his paintings often reference a geographical location and reveal the essence of that environment. For instance, the force and magnitude of a wave crashing up against the rocky shore is expressed in Wave Painting 9/26/68 (1968). These small panel paintings which include titles such as Des Moines Landscape 6/19/69 (1969), Landscape: Cross Motif (1968), and Williamsburg Bridge (1966) were painted en-plein-air in a homage to McNeil’s modernist predecessors who took in the immediacy of the natural landscape by painting outdoors. McNeil’s paintings in this manner show his interest in the fundamental nature and physical force of the environment and bear little resemblance to earlier en-plein-air paintings by the Impressionists. Instead of taking the naturalist approach of the Impressionists, McNeil employed full force Expressionism through signature thick impasto bands of sweeping color to the surface of these small panels in a spontaneous and subconscious process. The works may be small but they exhibit a momentous presence. 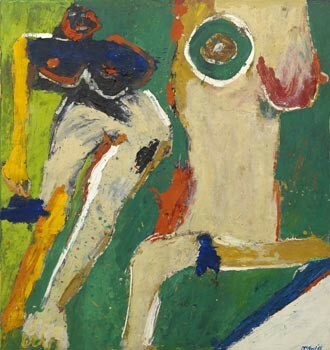 In later –much larger– paintings, in a style that reveals a connection to Neo-Expressionists, McNeil painted non-linear figurative narratives to describe the energy and movement of the landscape. For example St. Marks Place (1988), 89 West 6th Street (1989), and Now Street #2 (1990) depict New York City’s fluctuating urban landscape. 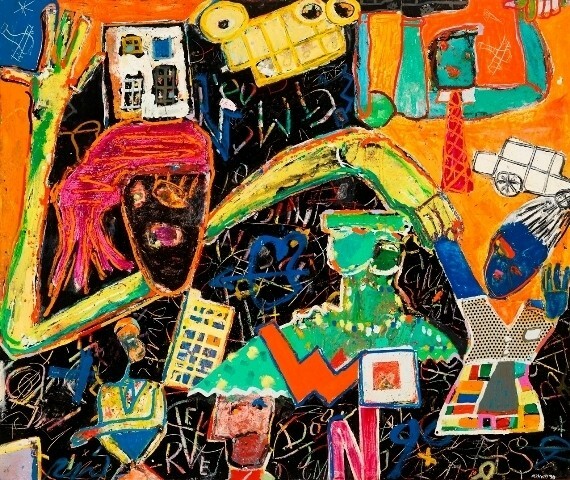 Across the picture plane of these paintings, there is recognizable imagery such as people in the crowd, cars, buses, towering buildings, and graffiti-like symbols. There is no sense of fixation as the city is in motion through time and space. The exhibition will be on view through February 21st at ACME Fine Art at 450 Harrison Avenue in Boston, and online at Artsy. "Thank you for this meaningful article. George McNeil was my teacher at Pratt Institute (MFA); also a friend who kept in touch. His letters to me are in the Smithsonian Archives."